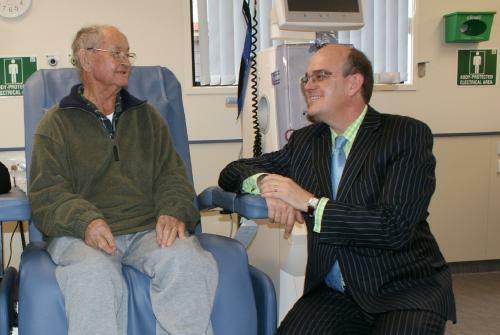 A new $1.3m satellite dialysis unit in Gisborne, officially opened today by Health Minister Tony Ryall, will save people travelling the 756km to Hamilton for treatment. “Previously some people travelled the 10 hour round trip from Gisborne to Hamilton and stayed away from their families for several weeks to have treatment,” says Mr Ryall. “I am also aware that some people have left the area as they’ve found the travel combined with the up to six hours of treatment three hours a week too onerous. “This government is committed to ensuring people have better, sooner, more convenient health services and this new dialysis unit will enable more Gisborne people to receive their treatment much closer to home. “Up to 36 people a week will use the six dialysis machines in the new facility. Specialist nurses, supported by a local physician, work in the unit and provide care for individuals where home-dialysis isn’t possible. If a person’s home is not suitable for a dialysis machine, for example, they will now be able to use this facility instead of travelling to Hamilton. “There are over 2300 people in New Zealand using dialysis to treat renal disease. Slightly more than half of these people manage their own dialysis at home or in the community. “Dialysis treatment at home or in the community means people can have a more normal life by fitting in the long treatments into their routine, rather than having to travel to Hamilton and attend set appointment times. “Having these satellite units also helps ensure the specialist dialysis unit at Waikato Hospital is reserved for people unable to manage at home or in the community. Earlier this year, Mr Ryall opened a community dialysis house in South Auckland, one of six community dialysis facilities opened throughout the country in the past four years. There are plans for two more dialysis units in Auckland and one in Wanganui.